There are only a few brands that can inspire an emotional reaction from those of us who love to drive, and Maserati is one of them. Sure, the Italian brand hasn’t always produced the best cars, but it has, at the very least, striven to produce beautiful and alluring machines. It seems like only yesterday when Maserati signalled its intent to step into the ring with Germany’s hardened executive saloons. So, it may well come as a surprise to you when we tell you the current Maserati Ghibli Saloon has been around for three years now. The hottest, most appealing, and least sensible, member of the Ghibli family is the ‘S’, and comes with a very special V6 heart. It just so happens to have been produced by another Italian brand that goes by the name of ‘Ferrari’, so there’s potential for something a bit special here. Let’s get straight to the juicy bit then – that 3.0-litre turbocharged V6 engine is built by Ferrari and produces not only a rather substantial 410PS, but a truly lovely soundtrack to match it. There isn’t another saloon currently on sale that can provide aural pleasure anything like this, and actually, you’d be lucky to find another new car on sale that sounds as good as the Maserati Ghibli S. Of course, it goes just as well as it sounds too. The trip to 62mph from a standstill takes just five seconds, and the top speed – if conditions allow – is 177mph. The Maserati Ghibli S comes equipped with an eight-speed automatic gearbox from famed gearbox maker ‘ZF’, a company that seems unable to make a bad gearbox. It is a really slick shifting unit and works well in every situation – from a lazy automatic motorway cruise to a fast-changing manual back road blast. With a powerful Ferrari-made unit leading the car on, the Maserati Ghibli S’ body has some work to do. The optional ‘Skyhook’ adaptive suspension system is a must-have, improving comfort and – more importantly – body control in the corners, helping the powerful Italian stay stable as it puts all that power to the ground. Being a heavy saloon, it doesn’t ever feel all that agile, but the light steering does a good job of masking the weight of the Maserati Ghibli S. Unfortunately, it sacrifices plenty of steering feel in order to do so. Thankfully, there is a vast amount of grip from the rear – important because it’s the rear wheels that handle all that power from the engine. You’d have to be an enormous risk-taker or plain stupid to unsettle the Maserati Ghibli S with the safety technology turned on, but with it off – and in a safe place – it will make some slides – if that’s what tickles your fancy. It isn’t very Maserati though, is it? Maserati makes some of the most beautiful cars on sale today, and the Maserati Ghibli Saloon is no different. Easily one of the most striking saloons on sale today, it has fantastic proportions and a number of charming small touches that can’t help but draw the eye. It is unmistakably Maserati, and that is exactly what you want it to be from a design perspective. It actually makes Germany’s top sellers look rather plain in comparison. Inside the Maserati Ghibli S, the striking exterior design with its subtle retro touches fades into a more modern approach. The traditional dash-mounted analogue Maserati clock is still there, but underneath is the new large infotainment touch screen where the majority of functions for the Maserati Ghibli S are controlled from. The dash itself is swathed in elegantly stitched leather, and while the plastics themselves might not be the absolute top quality you might expect from Maserati, they are more than good enough for a car at this price point. Crucially, the areas that matter are very well addressed and the seating is one of those areas. Maserati has done an excellent job in offering comfortable and supportive seats wrapped in more beautiful leather and coming with highly adjustable electronic controls. Speaking in more sensible terms, there is plenty of space available in the boot, 500 litres to be exact, but there isn’t as much space available for passengers in the rear. Only two adults will get into the back; the middle seat is only suitable for a child on a booster cushion, and leg and head room isn’t the best. 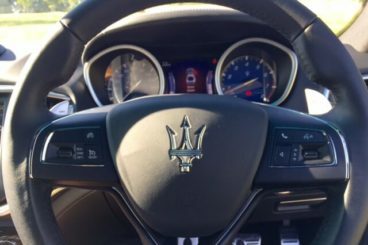 If you take a seat in the Maserati Ghibli S you’ll notice fairly quickly that the dashboard design revolves around the touchscreen system. 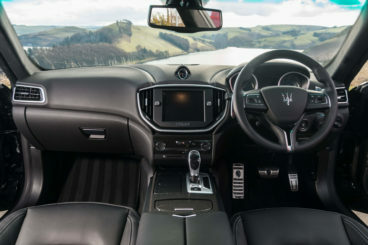 Sadly, it isn’t really competitive when stacked up alongside its rivals’ systems, but it isn’t a hindrance to the Maserati Ghibli S’ success either, it’s just a very average touchscreen system that perhaps needs refining and evolving to really feel at home in a luxury brand like Maserati. As with many luxury cars there is a range of optional extras to choose from. Get carried away and the price of your Maserati Ghibli S will shoot up by the thousands. But to give you an idea of what’s on offer we shall ignore pricing for the time being. 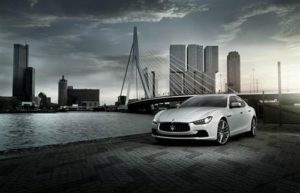 You can – if you so wish – choose from some packages that can give your new Maserati Ghibli S things such as a heated steering wheel, heated/ventilated seating, sporty design touches, and there’s even the option of having a special Ermenegildo Zegna edition Ghibli S. Zegna is one of the world’s leading menswear brands, and the Zegna edition provides some very swish touches indeed. If you tick just one box, make sure it’s the £2,045 ‘Skyhook’ suspension system, it improves the car hugely. Maserati does a good job in offering heavy customisation for those who can indulge in it, but for those looking to keep the cost down and keep it basic, you’ll be pleased to know the Maserati Ghibli S is well equipped. Adaptive LED lighting, a limited slip diff, climate and cruise control, and sat nav are all standard, amongst a host of other things. Maserati offers amazing cars at serious prices, and the Ghibli S is waving the flag for good value. We found that a contract hire lease on a new Ghibli S, will set you back around £756 a month with a £7902 deposit, and that’s based on 10000 miles a year. Business users will get the same deal for £630 with a £6010 deposit. To buy outright, a new Ghibli S will set you back £64,510, but there are deals to be had out there, so make sure you shop around to get the best bargain. There are very few cars that can compete with Maserati for outright style and beauty. The Maserati Ghibli S is yet another stunning piece of metal from the Italian company, and none of its rivals have anything like the looks of the Ghibli S.
Made by Ferrari, the stunning 3.0-litre V6 is everything you want from an engine. Powerful, smooth, and blessed with a quite exquisite soundtrack, this is a very special unit indeed and is a fitting centrepiece for the Maserati Ghibli S.
With an array of customisation options, each Maserati Ghibli S sold will be individual to the customer. On top of that, there will be far fewer on the road too. Maserati is a relatively low-volume producer, so if you have a Ghibli S you won’t often see another. The Maserati Ghibli S is far more expensive than its rivals. It is questionable whether the quality is there to justify the high price, too. Inside, the Maserati Ghibli S falls down a little in choice of materials. Some of the plastics and finishes are not what you’d expect of a brand like Maserati and, as such, it can be a little bit disappointing. Make no mistake, the interior is still quality, but it just isn’t quite as good as it could be. More crucially, it isn’t quite as good as its rivals. The Maserati Ghibli S doesn’t have a 2+2 layout, but space in the back should be much better in a saloon of this size. For many this won’t be a deal breaker, but being able to transport people in comfort is an important feature of any saloon, even a fast Maserati. We love this Italian stallion, but the tuneful, toned brute will have to demonstrate why it’s the go-to fast luxury saloon. So, let’s compare it with two major rivals – the BMW 5-series (535i) and the Jaguar XF V6 S.
The BMW 5-series is the benchmark for cars in this segment, and amongst the vast line up of 5-series engines is the Maserati Ghibli S’ opponent, the petrol-powered 535i. 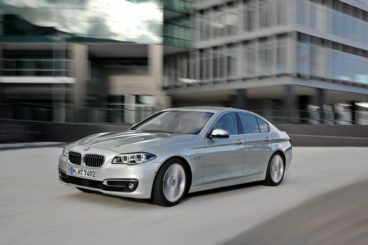 Powered by a 3.0-litre twin-turbo six-cylinder engine, the 535i is another smooth pulling beast and can propel the heavy 5-series body to 62mph in 6 seconds, doing so by using an automatic gearbox near-identical to the box found in the Maserati Ghibli S.
Sadly, for the BMW, the engine isn’t anywhere near as powerful or as charismatic as the Maserati Ghibli S’, and while it may be enormously competent and – for what it is – fairly economical, it just doesn’t thrill like the Maserati Ghibli S’ engine does. However, the BMW has the Italian upstart beaten dynamically. It is very hard to argue a case for the Maserati Ghibli S being better in the corners than the 5-series. While the BMW 5-series feels a little bit heavier, it grips and turns astonishingly well for a car of its size, while also proving to be hugely comfortable over long distances. It helps that the interior design and quality is higher than in the Maserati too, it’s a better place to spend longer trips. We mentioned the price when listing the cons of the Ghibli S, but this really puts it into perspective. Coming in at just over £45,000 in ‘M-Sport’ trim, the BMW 535i is almost £20,000 cheaper than the Maserati, and by anyone’s standards that is an awful lot of money. As a matter of fact, you can even get the top-spec 550i 449bhp V8 engine for a few thousand less than the Maserati Ghibli S.
So the Maserati Ghibli S was really built and engineered to take the fight to the fast German saloons that dominate this sector of the market. But let’s not forget that Jaguar has also been stepping into the ring with Deutschland’s finest recently. The Jaguar XF V6 S is Britain’s answer to the Maserati Ghibli S, and is a great match for the Italian. 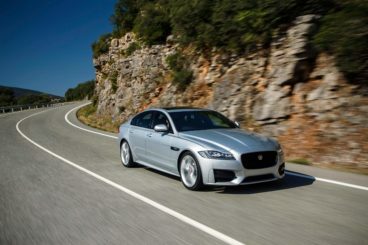 Powered, this time, by a supercharged version of a 3.0-litre six-cylinder engine, the XF V6 S has 380PS to use under its bonnet and also has the same eight-speed gearbox its rivals in this article are using. The result? 0-62mph is reached in 5.3 seconds, and a top speed of 155mph is obtainable. With stats like this, the Jaguar XF V6 S is easily the most consistent rival to the Maserati Ghibli Saloon, but it is very much lacking in style and is a little bit plain to the eye, also looking identical to its smaller brother – the XE. While it is all very well made and absolutely a quality product, it is quite a sterile and uninspiring design, even if the car happens to handle sweetly and has that fine supercharged engine to push it along. It may be more expensive than the BMW 535i, but it still comes in at just under £50,000, making it still a lot cheaper than the Maserati Ghibli S, and if it just felt a little bit more special, it would surely be a no-brainer. Yes, it seems like we are getting our little book of motoring clichés out here, by telling you that you buy a Maserati with your heart and not your head. 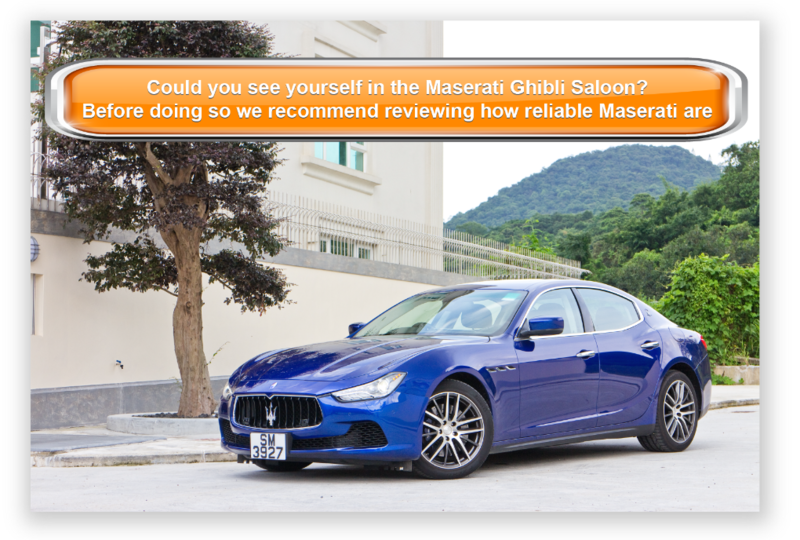 But by pricing the Maserati Ghibli S so highly, the Italian automaker is giving customers no other choice. Both the BMW 5-series and the Jaguar XF V6 S are superior machines on a technical level, and at many thousands of pounds cheaper. They also represent far better value. So, why is it we aren’t wrapping this review up right here? Facts, figures, efficiency, superiority, they are all perfectly relevant when it comes to reviewing cars. But, there’s another factor. If you drive a BMW, a Mercedes-Benz, or even one of a Jaguar’s new saloons, you walk into your house at the end of the day and close the door behind you, just like anybody else. If you drive a Maserati, you do exactly the same thing, except, just before you sit down, you peek out of the curtains, briefly gaze upon the Bolognese native parked outside, and smile. What price you put on that feeling is entirely down to you.